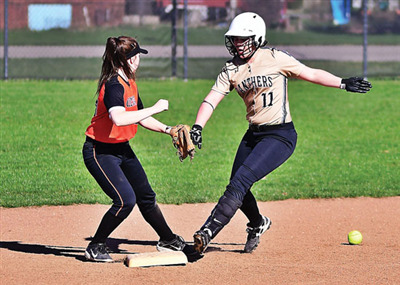 ROCKFORD — The Parkway softball team conducted a clinic — hitting, fielding, pitching, and baserunning — in a 50-minute 11-0 run rule win over Coldwater Tuesday. The Lady Panthers are now 7-0 overall and 2-0 in the MAC. The Lady Cavaliers are 3-5 and 0-2. 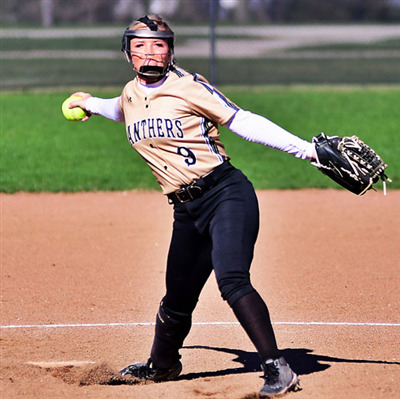 With both pitchers firing strikes — Parkway’s Macy Henkle 32 out of only 44 pitches, Coldwater’s Maddie Steinke 59 out of 82 — and walking absolutely nobody, the game moved right along. If not for some shaky Coldwater defense, however, the game would never have approached run-rule territory. The Cavaliers had three costly errors, and several other balls were playable but mis-judged. The Panthers were errorless in the field, and nothing even approached a mis-play. Steinke had blanked Wapakoneta 2-0 Monday, which is indicative of her ability. The Parkway lineup, however, is stuffed with powerful bats that will test any defense. The Panthers had five doubles in the game, and every one of those was hard-hit. Parkway had four batters with multiple hits — DP McKenna Temple (2 for 2, both doubles, two runs, one RBI), centerfielder Alyssa Miller (2 for 3, including a double, two runs, two RBI), Henkle (2 for 3, including a double, one RBI), and catcher Allie Ford (2 for 3, one RBI). Third baseman Bailey Strickler was 1 for 3, a double, scored once, and drove one in. Leftfielder Grace Swander and shortstop Claire Langenkamp each had a single. Henkle was remarkably efficient, never needing more than ten pitches in any inning. Coldwater had four hits but not more than one in an inning, and no Cavalier ever got beyond second base. Henkle struck out only one batter and walked nobody. Coldwater’s four hits came from shortstop Kate Leichty, centerfielder Molly Steinke (a double), catcher Rachel Klosterman, and first baseman Macy Sheffer (a double). Grace Stammen 2b 2-0-0-0, Kate Leichty ss 2-0-1-0, Molly Steinke cf 2-0-1-0, Maddie Steinke p 2-0-0-0, Sierra Timmerman dp 2-0-0-0, Audrey Zeigler lf 2-0-0-0, Rachel Klosterman c 2-0-1-0, Kamryn Rutchling cr 0-0-0-0, Macy Sheffer 1b 2-0-1-0, Annelise Harlamert pr 0-0-0-0, Maddie Sheffer 3b 2-0-0-0, Leanne Klenke rf 0-0-0-0. Totals 18-0-4-0. Macy Henkle p 3-0-2-1, Maddy Kroeger cr 0-2-0-0, McKayla Sites rf 3-0-0-0, Bailey Strickler 3b 3-1-1-1, McKenna Temple dp 2-2-2-1, Mecayla Hesse 2b/pr 0-1-0-0, Alyssa Miller cf 3-2-2-2, Allie Ford c 3-0-2-1, Kris Kirby cr 0-2-0-0, Lauren Henderson 1b 3-0-0-0, Grace Swander lf 3-0-1-1, Shae Thomas pr 0-0-0-0, Claire Langenkamp ss 3-1-1-0. Totals 26-11-11-7. Errors: Stammen, Zeigler, Maddie Sheffer. DP: Strickler to Hesse. SB: Leichty. HBP: Temple (by Maddie Steinke). Doubles: Molly Steinke, Macy Sheffer, Henkle, Strickler, Temple 2, Miller. LOB: CW 3, PW 4. Pitches/Strikes: Maddie Steinke 82/59, Henkle 44/32.